Last night, I had another wonderful dream with my dear dear Bhagavan Sri Skanda. I dreamt that I was seated on something and my body was swaying side-to-side. I noticed that I was seated beside something - as I turned my head to the left, I was surprised. It was Bodhinatha Velayanswami. He smiled at me and then instantly transformed into a golden moorthi. It was a moorthi of Sri Skanda  the same one that I pray to at the Thiruchendur Murugan Temple. 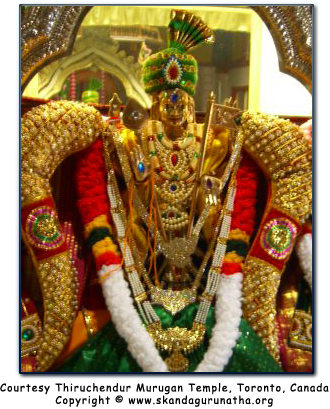 He looked so exquisite adorned with a nice white silk veshti, flower garlands, and sparkling jewelry. I joyously sat near Him absorbing the bliss that exuded from His darshan. Bhagavan Sri Skanda's form in my dream was exactly like the eluntha-aruli (utsava) murthi that we carry around the temple during Thiruvilla on Fridays. As I sat on Sri Skanda's right side (it was just him and me  no Valli or Deivayaanai), I wondered why we were swaying side to side. I looked down to find the reason, I saw four heads. There were four people carrying us - by us, I mean, Murugan and myself. I didn't recognize the four devotees' faces but I also realized something else  I couldn't see their bodies. The reason being, their bodies were covered with water. Sri Skanda and I were being carried by four people who were neck deep in water. We were crossing a pond during the daytime and everywhere I looked  I saw many small lotus flowers floating on the surface. The beautiful flowers were white in color with a pink hue. The small lotus flowers, however, were gently brushed aside by the ripples created by the waves as we were carried across the pond by the four unknown devotees. I was so happy to be in my beloved Skanda's presence. Then I thought, aren't those poor devotees who are carrying us going to drown if the water level gets any higher than their necks? It was then when I awoke. Oh Murugaa! What punyam did I do to deserve such a wonderful experience with you? What did I do to even sit this close with you aiya? How blessed I am to always have you continually grace my life in this and many other ways. My beloved Skandagurunatha! Ammavum nee! Appavum nee! Satguruvum nee! Deivamum nee! (You are my mother, father, guru and god). Thank you sooooooooooooooooooooooooo much for your grace, my Lord.